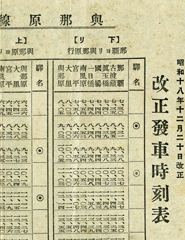 The timetable published by the Okinawa Prefecture Light Rail Office in 1943. A timetable published by the Okinawa Prefecture Light Rail Office in 1943 was found in Gushichan, Yaese. Kaoru Nakamoto found the timetable inside his late father Minoru Nakamoto’s diary when he was cleaning up his father’s belongings. In the diary, there was also a detailed description of the times, explaining how his father and the family escaped during the Battle of Okinawa. There was a note written on April 1, 1945, just before the American troops landed in Okinawa. Nakamoto gave a copy of the diary to Ryoji Nakayoshi the president of the Okinawa Urban Monorail Inc., saying, “The diary lets us know how the light rail worked for the benefit of the people of Okinawa before the war.” Officials comment that very few timetables have been found, and that this is an item of historical significance. 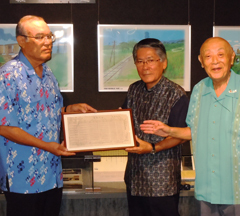 The copy will be displayed in the exhibition hall of Okinawa Urban Monorail and the original diary will be donated to the Museum of History and Folklore in Gushichan, Yaese. The late Minoru Nakamoto kept a diary using the space on a timetable. 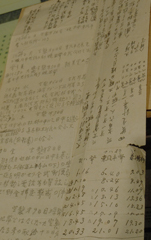 He wrote how his family fled from Gushichan to Kin. Minoru Nakamoto is also famous as a songwriter. He wrote the lyrics for Ashimijibushi, a folk song about the joy of work, for which Choho Miyara composed the music. When he was working as a postmaster of Gushichan he bought the timetable, which contained timetables of three rail-lines: Naha to Itoman, Yonabaru, and Kadena, and his local station, Kochinda, had a red circle around it. The diary started from March 25, 1945, with the comment, “Air raids last for three days, we left our house in the evening,” and finished on April 1, “It is a fine day. Air raids have lasted for ten days until today.” His family members left the house in Gushichan and were captured in Kin, where they became prisoners of war. Kaoru Nakamoto (second on the left) donated a copy of the light rail timetable to Ryoji Nakayoshi (left), the president of Okinawa Urban Monorail Inc. On April 20, 2012 at the Yui Rail Exhibition Hall.